Fred Magdoff is professor emeritus of plant and soil science at the University of Vermont. John Bellamy Foster is editor of Monthly Review and professor of sociology at University of Oregon. They are the coauthors of The Great Financial Crisis (2009) and What Every Environmentalist Needs to Know About Capitalism (2011)—both published by Monthly Review Press. Workers in the United States are in a very difficult situation—one made significantly worse by the Great Recession and the very slow “recovery.” The latest data as we write this (available for January 2013) indicates that although the unemployment rate has declined from its peak and is now at 7.9 percent, when those working part time but wanting full-time jobs and those who have given up looking for work are added in, 14.4 percent of the labor force currently needs full-time employment.1 To give some idea of the meaning of such a large percentage needing full-time jobs, this represents 22 million people, compared to total nonfarm private-sector employment of about 113 million. Given the large portion of workers in part-time positions, there are currently less than 100 million full-time-equivalent jobs left in the private sector.2 With the public sector hiring few if any workers for the foreseeable future, and no New Deal-type works program in the cards, the private sector will be the source of whatever job increases occur. As if the current employment situation is not bad enough, there has also been a long-term decline in the relative power of the working class, with capital increasingly gaining the upper hand. One crucial indication of this is the stagnation or decline over decades of real wages (corrected for inflation). For a while workers’ lost ground with respect to wages was compensated for by more women entering the labor force so that households increasingly had two earners, helping to maintain household income. However, over the last decade there has even been a downward trend in median family income—decreasing from $54,841 in 2000 to $50,054 in 2011 (both in 2011 dollars).3 The financial impact of the Great Recession has had a devastating effect on many people—with millions declaring bankruptcy, losing homes to foreclosure, or being forced “underwater” (owing more than the worth) on their homes. Sources: “All employees” is government and non-profit-sector employees plus private-sector employees (excluding non-profit employees here from the private sector). Compensation for government employees from Table 1.13, “National Income by Sector, Legal Form of Organization, and Type of Income,” National Income and Product Accounts (NIPA), Bureau of Economic Analysis (BEA); Compensation for private sector employees, is from unpublished Bureau of Labor Statistics (BLS) data; “Gross Domestic Product” (GDP), St. Louis Federal Reserve (FRED Database), http://research.stlouisfed.org/fred2. BLS data for private sector compensation provided by personal communication from the Supervisory Economist, Office of Productivity and Technology Division of Major Sector Productivity. 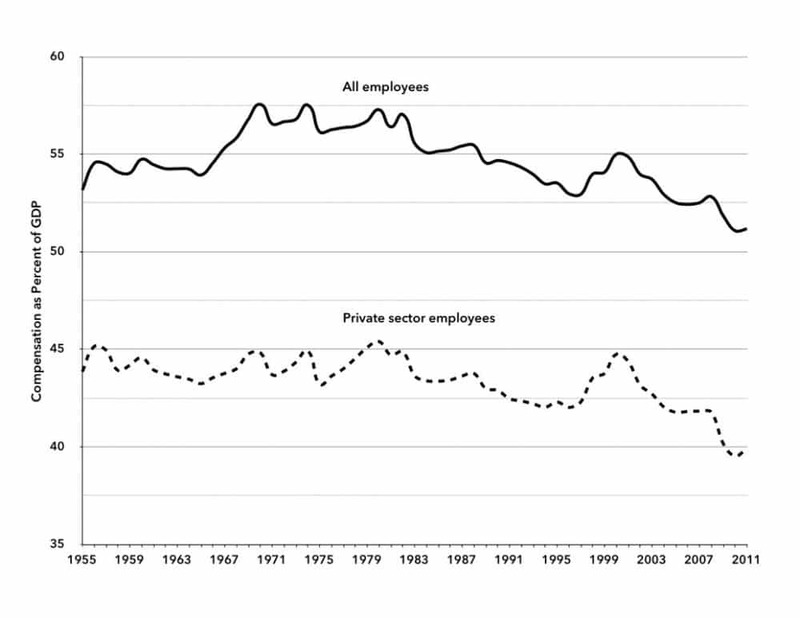 Chart 1 shows that total compensation of both all employees and private sector employees as a percent of GDP continued a downward slide for most of the 1980s, ‘90s, and the first decade of this century. However, a brief bump up was experienced in the second half of the 1990s. The temporary rise in the compensation share at that time was mainly a product of the dot-com financial boom, which turned into a bust in 2000. The bursting of the dot-com bubble led to a sudden drop in the compensation share, which was given an added downward push by the Great Recession less than a decade later. Wages and salaries, as distinct from total compensation, are especially important for workers at the lower-income levels, since this is the basis of their everyday consumption, constituting their means of subsistence. As with total compensation—only more so—wages and salaries exhibited a strong downward trend as a percentage of national output of goods and services (Chart 2). 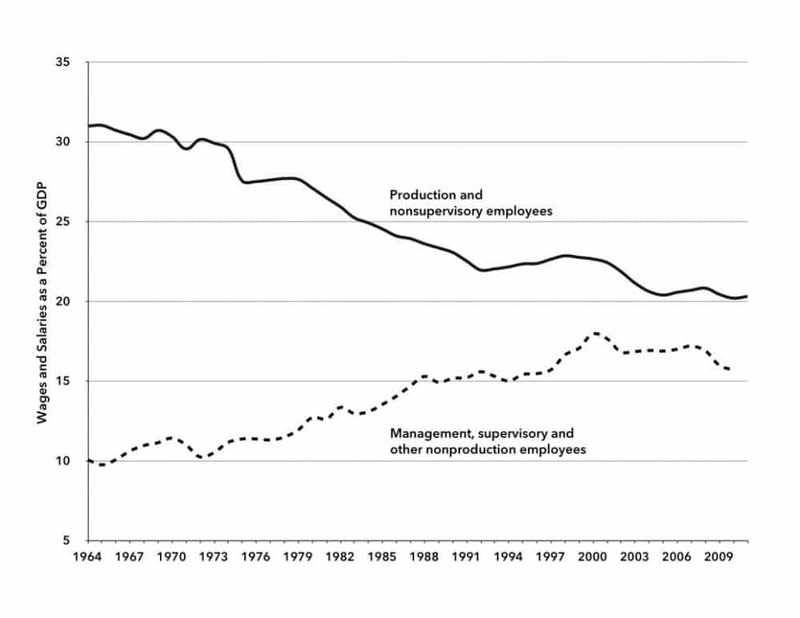 Similar to what we observed in the case of the total-compensation share, a brief, cyclical increase in the wage share is evident for all employees in the late 1960s and early ‘70s (upper line). But just as we saw with respect to total compensation, this short-term increase in the wage share disappears once we look at the wages and salaries of private-sector employees as a percent of GDP (lower line). Hence, the rising wage share for all employees in these years is once again explained primarily by the expansion of government and non-profit-sector employment, and subsequently eroded along with the decline of government consumption and investment as a percent of GDP beginning in the 1970s.16 It was not until the late 1990s dot-com bubble that one again sees significant employment gains, as well as modest increases in wages and salaries, resulting in a very brief increase in the share of wages and salaries in GDP—though never approaching its previous peaks, and plummeting thereafter. Sources: Salary and wages for all employees and private sector employees from Table 1.12, NIPA, BEA; GDP, FRED Database. Overall the decline in real wages (corrected for inflation) since the 1970s has been sharp. 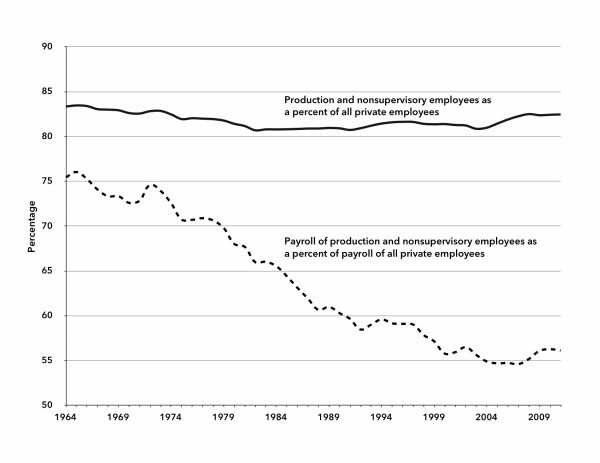 As David Gordon observed in 1996 in Fat and Mean, by the early 1990s the real hourly spendable earnings of private nonproduction/nonsupervisory employees in the United States had fallen “below the level they had last reached in 1967…. Referring to these trends since the early 1970s as ‘the wage squeeze’ is polite understatement. Calling it the ‘wage collapse’ might be more apt.”17 While the real hourly wage for all nonfarm private workers has declined, weekly (or annual) wages and salaries have fallen even faster. In the early 1970s the average earnings of nonfarm private workers was over $340 per week (in 1982–1984 dollars). Earnings of these workers declined rapidly to less than $270 per week in the early 1990s, rebounding to $294 per week by 2011—still close to 15 percent less than in 1973.18 The decline in real income per week was the product of two trends: (1) stagnating and declining real hourly wages and (2) the decline of hours worked per week. As more people worked part time, the average hours worked in private sector nonfarm jobs declined from 38.6 hours in 1965 to 33.6 hours in 2011.19 It was this combination of declining real wages and fewer hours worked that left workers poorer and in more precarious positions. Chart 3 provides data related to production and nonsupervisory employees. While the share of the GDP going to the wages and salaries of all private employees has, as we have seen, decreased dramatically (lower line in chart 2), the drop in the wage income of production and nonsupervisory workers as depicted here has been even more startling. 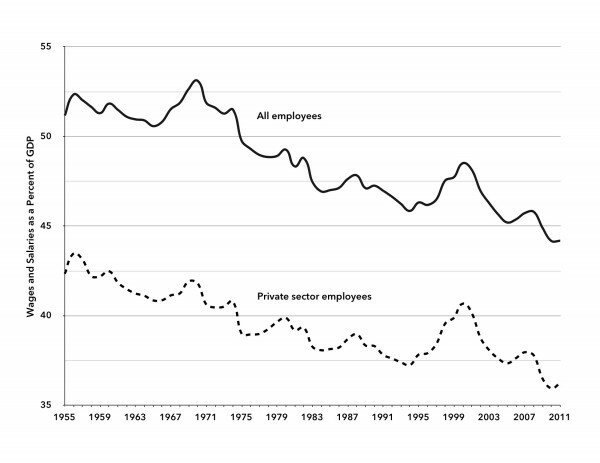 Chart 3 shows that private-sector production and nonsupervisory workers have remained a fairly constant percentage of all private employment from the mid–1960s to the present. 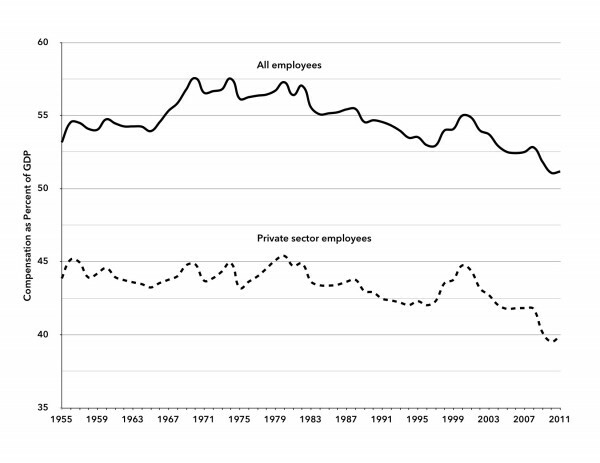 (See the top line in the chart, indicating that these workers represented around 83 percent of all private sector workers in both 1965 and 2011.) 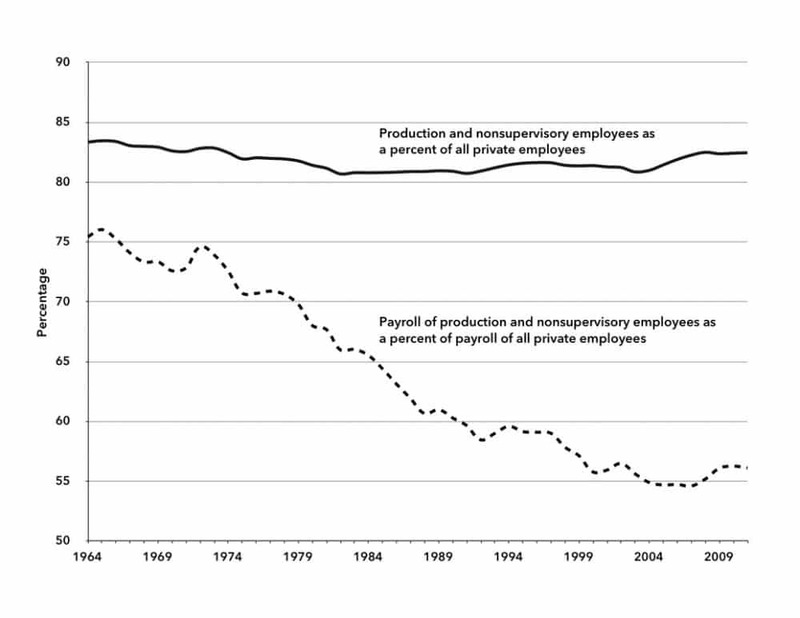 Nevertheless, the share of production and nonsupervisory workers in the total private sector payroll dropped from over 75 percent in 1965 to less than 55 percent during the Great Recession, and has only risen slightly since. Sources: Number of private sector production and nonsupervisory employees from BLS Series CES0500000006; Total private sector employees from “All Employees: Total Private Industries” (USPRIV), FRED database; Annual payroll of production and nonsupervisory is calculated from weekly aggregate payroll, BLS Series CES0500000082; Aggregate payroll of all private employees from Table 1.12, NIPA, BEA. The implication of this, of course, is that the management, supervisory and other nonproduction employees at the top, representing around 17 percent of private employees, receive more than 40 percent of private sector wage and salary income—and this share is rising. 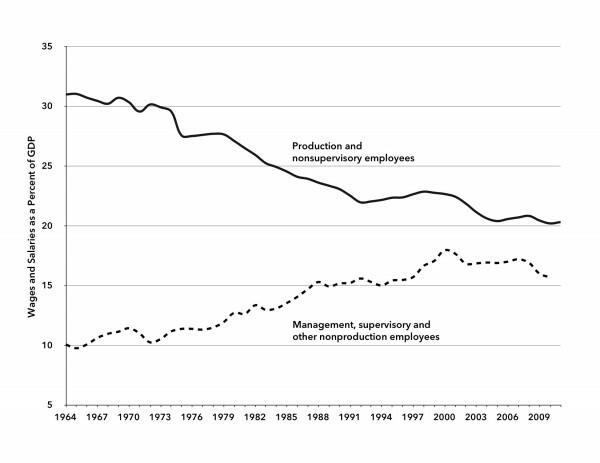 We see the contrasts even more clearly when we look in Chart 4 at the shares of GDP going to the two separate groups that make up private employees—production and nonsupervisory employees versus what we have labeled as management, supervisory, and other nonproduction employees. Wages and salaries received by the upper levels of private employees actually increased from 1965 to the present as a share of GDP. At the same time, those of the over 80 percent of private-sector workers in the production and nonsupervisory worker category saw their wages and salaries decline dramatically, from over 30 percent of the GDP to about 20 percent in 2011. Hence, the rapidly declining wage share in the monopoly-finance-capital period since the mid–1970s stagflation crisis fell entirely on the backs of working-class employees. Sources: Same as Chart 3, with share of GDP to “Management, supervisory and other nonproductive employees” calculated by subtraction of wages and salaries of “production and nonsupervisory employees” from wages and salaries of all private sector employees. Given this background of high unemployment, lower-wage jobs, and smaller portions of the pie going to workers, it should come as no surprise that, according to the U.S. Census Bureau, nearly 50 million people in the United States live in poverty (with income in 2011 below $23,021 for a family of four) while another 50 million live between the poverty level and twice the poverty level—one paycheck away from economic disaster.23 Thus, the poor (those in poverty or near poverty), most of whom belong to the working poor, account for approximately 100 million people, fully one-third of the entire U.S. population. Writing more than a decade ago, Bill Moyers commented on the plight of labor as follows: “Our business and political class owes us better than this. After all, it was they who declared class war 20 years ago, and it was they who won. They’re on top.”24 However, the way the system works, the ruling class does not owe workers anything aside from wages and salary earned and legally required benefits. And the attack on labor—its unions, wages, working conditions, social programs, and even legally required benefits—continues to this day. ↩ U.S. Bureau of Labor Statistics, Economic News Release, Alternative Measures of Labor Utilization, Table A-15, http://bls.gov. ↩ Ninety-six million full time equivalent private sector workers calculated assuming a forty hour work week and using actual hours worked per week from Average Weekly Hours Of All Employees: Total Private (AWHAETP) and number of private employees from All Employees: Total Private Industries (USPRIV), from St. Louis Federal Reserve FRED database, http://research.stlouisfed.org/fred2/, December 30, 2012. ↩ U.S. Census Bureau, Historical Income Tables: Households, Table H-6. Regions—All Races by Median and Mean, http://census.gov. ↩ Melanie Trottman and Kris Maher, “Organized Labor Loses Members,” Wall Street Journal, January 23, 2013, http://online.wsj.com. ↩ Catherine Rampell, “Majority of New Jobs Pay Low Wages, Study Finds,” New York Times, August 30, 2012, http://nytimes.com. ↩ St. Louis Federal Reserve, FRED database, Employed, Usually Work Part Time (LNS12600000), January 4, 2013, http://research.stlouisfed.org. ↩ Bureau of Labor Statistics database, Employment, Hours, and Earnings from the Current Employment Statistics survey (National), Employees Temporary Help Services (series ID CES6056132001), http://data.bls.gov. ↩ James K. Galbraith, Created Unequal (New York: The Free Press, 1998), 82–83. ↩ Margaret Jacobson and Filippo Occhino, “Behind the Decline in Labor’s Share of Income,” Cleveland Federal Reserve, 2012, http://clevelandfed.org; Congressional Budget Office, What Accounts for the Slow Growth of the Economy After the Recession? (see Figure 7, p. 14), 2012, http://cbo.gov. Galbraith’s data here shows that direct income to capital in the form of interest, dividends, and rent increased from 10 percent of personal income in the 1940s to 17 percent in the 1990s. ↩ Data on total compensation also includes “other compensation” such as bonuses and stock options mainly applying to upper-level management. It does not, however, include capital gains which are the main source of the increasing wealth of the capitalist class. ↩ Bureau of Labor Statistics, U.S. Department of Labor, “Employer Costs for Employee Compensation” database, http://bls.gov. ↩Economic Policy Institute, The State of Working America, 12th edition (Ithaca, NY: Cornell University Press, 2012), 182. ↩ Michał Kalecki, The Last Phase of Capitalism (New York: Monthly Review Press, 1971), 110. ↩ Bureau of Labor Statistics, Current Employment Statistics Survey, http://bls.gov. ↩ John Bellamy Foster and Fred Magdoff, Great Financial Crisis (New York: Monthly Review Press, 2012), 129. ↩ On government spending (government consumption and investment) as a percent of GDP over the post-Second World War period, see John Bellamy Foster and Robert W. McChesney, “A New New Deal Under Obama?,” Monthly Review 60, no. 9 (February 2009): 4–5. ↩ David M. Gordon, Fat and Mean (New York; Free Press, 1996), 19–20. ↩ Calculated from Table B-47 of the 2012 Economic Report of the President, http://gpo.gov. ↩ Table B-47, Hours and earnings in private nonagricultural industries, 1965–2011, 2012 Economic Report of the President, http://gpo.gov. ↩ Economic Policy Institute, The State of Working America, 12th edition, 186. The data goes up to the ninety-fifth percentile and does not include the income of the top 5 percent of the population. ↩ See Michael Zweig, “Six Points on Class,” in Michael Yates, ed., More Unequal (New York: Monthly Review Press, 2007), 173–82. In a larger sense the working class also can be seen as including many of those on public assistance and who have retired as well, along with dependents. But we are dealing here only with the working class as a component of the officially designated labor force. ↩ From St. Louis Federal Reserve FRED database, Production and Nonsupervisory Employees: Total Private (CES0500000006), updated January 1, 2013, http://research.stlouisfed.org. ↩ Carmen DeNavas-Walt, Bernadette D. Proctor, Jessica C. Smith, Income, Poverty, and Health Insurance Coverage in the United States: 2011, United States Census Bureau, 2012, http://census.gov. ↩ Bill Moyers, “Which America Will We Be Now?,” The Nation 271, no. 16 (November 19, 2001): 11–14. ↩ “Right Direction or Wrong Track: 35% Say U.S. Heading in the Right Direction,” Rasmussen Reports, January 23, 2013, http://rasmussenreports.com.